Skin cancer is a condition that develops as a result of prolonged exposure to ultraviolet light. This prolonged exposure then causes the skin cells to grow in a rapid, out of control way ultimately leading to the formation of a cancerous tumour on the skin. Approximately 60,000 people in the UK develop this condition each year. However, what many people do not know is that not all skin cancers are the same. There are actually three different types; Basal Cell Carcinoma, Squamous Cell Carcinoma and Malignant Melanoma. In this article article I will be discussing these three in greater detail. 1) BASAL CELL CARCINOMA (BCC):- This is the most common form of skin cancer and accounts for 75% of all diagnoses. As the name suggests it begins when the process of cell division goes wrong in the basal cells of the epidermis (the outer layer of the skin) and a cancerous tumour forms. This tumour often looks like a red ulcer on the skin which may bleed, crust or itch and is often given the nickname 'rodent ulcer'. Basal cell carcinoma typically appears on areas of the body that are exposed to the sun such as the arms, legs and face. Although it is the most common type of skin carcinoma it rarely kills. However, it can disfigure the skin if left untreated for a long period. 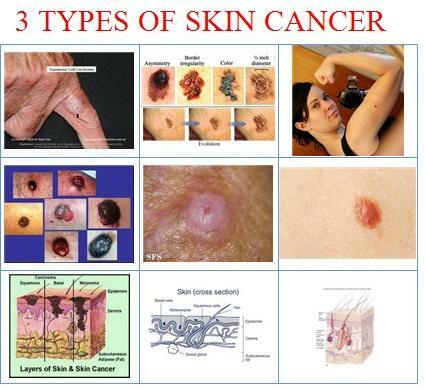 2) SQUAMOUS CELL CARCINOMA:- This type of skin cancer accounts for between 15% and 20% of skin cancers. It begins when the squamous cells of the epidermis start to grow in a rapid and uncontrollable way which ultimately leads to the development of a cancerous tumour. This tumour often resembles a hard red lump or a flat, scaly, scab like area. Like BCC, squamous cell carcinoma often appears on parts of the body that are exposed to the sun and rarely kills. However, if left untreated it can spread to other areas of the body. 3) MALIGNANT MELANOMA:- This type of skin cancer represents less than 10% of diagnoses. It develops in melanin producing skin cells called melanocytes. Malignant melanoma begins when the process of cell division goes wrong in these melanocytes and they start to divide and multiply uncontrollably leading to the development of a tumour. This tumour has a large, brown mole like appearance and can appear on your arms, back, leg or face. Although it resembles a mole there are subtle differences, Malignant melanomas are often a different colour to normal moles and they are often larger and more uneven. Unlike BCC and SCC, this type of cancer is very dangerous if not treated quickly and accounts for the majority of skin cancer fatalities. I hope this article has given you an insight in to this type of cancer. Whilst skin blemishes and odd looking moles may be non-cancerous they are a cause for concern. If you notice anything suspicious on your skin which does not disappear within a month then you should go see your doctor immediately. Early detection is a key element in the successful treatment of skin cancer and so it is far better to take the time and get yourself tested. Whilst every intention has been made to make this article accurate and informative, it is intended for general information only. Skin cancer is a very serious, life threatening condition and you should discuss any concerns, treatments or lifestyle changes fully with your doctor.